We celebrated a milestone in Family House history on September 12, 2018 as the community gathered to break ground for our expansion. The expansion will nearly double the number of guest rooms, from 40 to 75, and the groundbreaking brings us closer to our dream of bringing comfort and care to more North Carolina families. Thank you to our "Shovel Dignitaries!" From left to right: current Family House Board President Dr. Ian Buchanan, Land & Building Committee Member Mary Beck, Capital Campaign Co-chairs Becky & Bob Woodruff, Project Manager Bruce Ballentine, Brian Maxwell of MHAworks Architecture, Chapel Hill Mayor Pam Hemminger, Family House Executive Director Janice McAdams, Jama Campbell & Cindy Jolly of the SECU Foundation, Dr. Matt Ewend of UNC Health Care, Glenn Kistler of JD Beam, Family House Director of Operations Jan Ross, and the 2017 Family House Volunteers of the Year Jean and Willie the dog Fetterman. SECU Foundation Board Chair Cindy Jolly and Executive Director Jama Campbell fulfilled the SECU Foundation campaign challenge grant of $2 million by presenting campaign co-chairs Dr. Matt Ewend, Bob Woodruff and Becky Woodruff and Family House Board President Dr. Ian Buchanan with a giant check. In turn, the campaign co-chairs presented the SECU Foundation with a giant deposit slip - "a first," said Ms. Jolly. Our building expansion would not be possible without this gift from the SECU Foundation. From left to right: Cindy Jolly and Jama Campbell of the SECU Foundation; Bob & Becky Woodruff; Dr. Ian Buchanan and Dr. Matt Ewend. "Today is a great day for Family House and for UNC Hospitals," said Dr. Buchanan. As Hurricane Florence was threatening the state, Dr. Buchanan talked about the needs of North Carolinians leaving their homes for reasons of saftey, health and wellness, whether for impending hurricanes or for serious illness. "It is our mission here to provide those guests who come to UNC Hospitals facing a terrible storm of their health and wellness with much more than a safe, clean and affordable place to stay. We provide them with caring, compassion and community that gives them strength and bolsters them during a very scary and uncertain time." Dr. Buchanan framed the need for expansion with the growth of UNC Hospitals during the 10 years that Family House has been open. "Today we have nearly 1,000 inpatient beds, well over 40,000 inpatient admissions a year, and almost 1.7 million outpatient visits a year. That growth has been tremendously beneficial for the people of North Carolina, because it allows us to serve more people. But it has also increased number who come from far parts of our state and other states who need a place like Family House to give them a place to stay, as well as comfort and support and community during a difficult time." Dr. Buchanan expressed gratitude for the work that has been underway for several years to nearly double the capacity of Family House. "Thanks to the tremendous engagement and help from organizations, sponsors, individuals, and many others, we are at this point of transformative expansion of Family House." 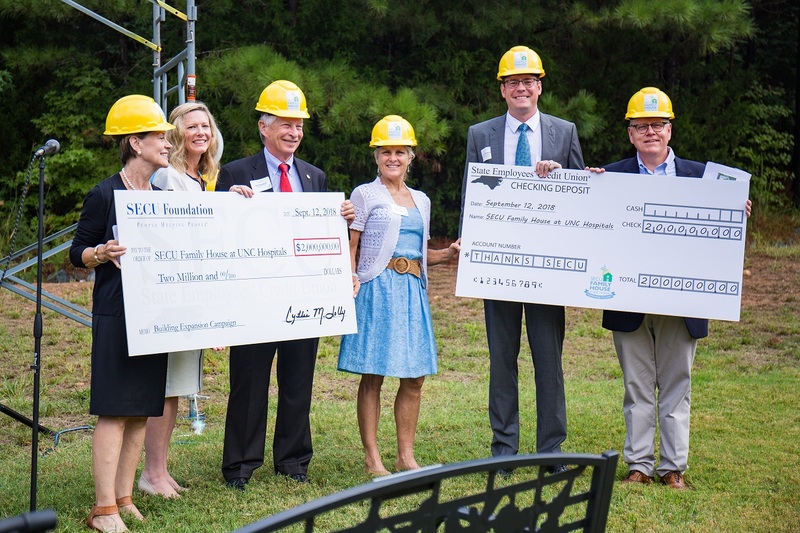 Dr. Matt Ewend, President of UNC Physicians and Chair of the UNC Department of Neurosurgery, past president of the Family House Board of Directors, and co-chair of the expansion campaign, gave an update on the fundraising for the expansion. "The Board started on this journey 4 or 5 years ago, and had faith in this community and in our wonderful partners. I am proud to announce we have raised $8.4 million, a spectacular accomplishment that exceeds our original goal." Dr. Ewend went on to describe that the Board has increased the fundraising goal to $9.6 million due to rising building prices and the cost of steel, which were anticipated. "I'm very confident we can raise the final $1.2 million, and that we will build this building and serve more people." Ms. Campbell recognized the number of SECU branch personnel and members in attendance, and introduced Ms. Jolly by thanking her for her longtime support of Family House. 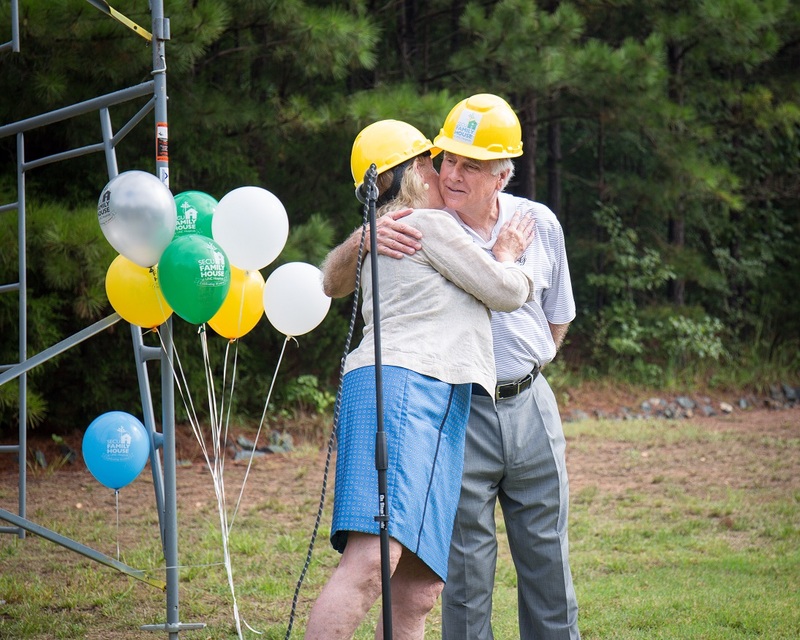 Ms. Jolly was on the Foundation Board when it gave the original gift to build Family House more than ten years ago. Ms. Jolly spoke of mission alignment with the Credit Union's People Helping People philosophy, and thanked Family House for its leadership as a flagship project. "We look at mission and purpose, capacity to implement, partnerships, and sustainability. In year one and in the ten years since you first opened, you have proven you can be successful in all those areas. Thank you for showing the rest of North Carolina the wonderful work you've done and for assisting other communities." Mayor Pam Hemminger recognized the Town of Chapel Hill council members in attendance and talked of the Town's core values of being a welcoming place for everyone, and of working in partnership. "Family House embraces and puts those ideals into action. The expansion is a wonderful community aspiration and you have made it a reality." The ceremony concluded with remarks from Family House Executive Director Janice McAdams, including recognition for the contributions of volunteer Bruce Ballentine, who has led the campaign's Land and Building Committee with skill and patience. One of the new rooms will be named in Mr. Ballentine's honor. Family House Executive Director Janice McAdams recognizes Land and Building Committee leader Bruce Ballentine. Construction on the new wing is slated to begin next month, and will continue for 18 months. To learn more about the expansion campaign, and to get involved, please visit secufamilyhouse.org/share or contact Martha Aldridge, Director of Development, at martha@secufamilyhouse.org or 919.932.8003.